Winner of the 2012 Gold Medal Mom's Choice Award! Who has the best imaginary friend? Is it Gary, who protects the galaxy with Sparky the robot? Or Tiffany, who helps save the day with Awesome Girl? Or Dustin, who can hide Mr. Bob in his pocket? During recess, Chad and Pingo are invited to participate in the contest to see which imaginary friend is the smartest or the strongest or the sneakiest. But when Jeremy, the schoolyard bully, and his imaginary friend, Grunt, barge into the contest, demanding to be included, no one expects what happens next — or how Pingo saves the day. Pingo and the Playground Bully is a delightful, full-color picture book about the power of kindness and the importance of including others. Brandon Mull brings us a cute story about Chad and and his imaginary friend Pingo. While playing at school Chad and his friends and their respective imaginary friends hold a contest to see whose imaginary friend is the best of all. When Pingo consistently comes in second both Chad and Pingo are disappointed until the Playground Bully, Jeremy, with his mean imaginary friend, Grunt, corner the group! Pingo saves the day using his amazing imagination showing everyone that "We're all good at different things. And that is what makes friendship fun!" A fun story with wonderful artwork by Brandon Dorman! My girls have enjoyed this book and have had a great time inventing their very own imaginary friends! It's okay to be different! I received a complimentary copy of Mull's latest picture book illustrated by the talented Brandon Dorman and my kids loved it! You know what? I loved it too, because there are several books out about bullying, but Brandon put a new spin on this age-old problem. PINGO helps even very young kids see how important it is to recognize talents and abilities in ALL of us and that we are all different and it's OKAY! And I have to add that I love how Pingo looks a bit like Brandon Mull! Chad and his imaginary friend Pingo are now in the second grade and things are heating up on the playground. It's a battle of the fittest, smartest and toughest imaginary friend--a competition to prove who is best. And poor Pingo keeps coming in second. He's not a fan of competition which only proves who is best at certain things. Plus the kids and their imaginaries have a problem on their hands with the bully Grunt and his keeper Jeremy. Pingo steps in to save the day in his own unique way. I loved this book with its message on friendship and bullying. It is perfect for young children to learn how to act before they hit the second grade. It would be a wonderful read aloud in pre school-first grade. The illustrations are incredible! I loved book one and I'm a fan of book two. Once again five stars to Pingo. I was so excited to review this new picture book from author Brandon Mull. This is his second book in this children's picture book series. I also was happy to have another book about being friends and not bullying. I teach second grade and this book is about second graders. The illustrations are so bright and colorful, done by Brandon Dorman. The story is so engaging as it starts by talking about the children and their imaginary friends playing on the playground. They are having fun until the playground bully threatens their fun. Then the story turns into a great lesson about kindness and how to include all children in their game. This is such a great message. Every day I hear about how someone was left out of a game and feelings were hurt. This is a story that will be read often in my classroom. Our younger children and grandchildren are facing new conflicts everyday. 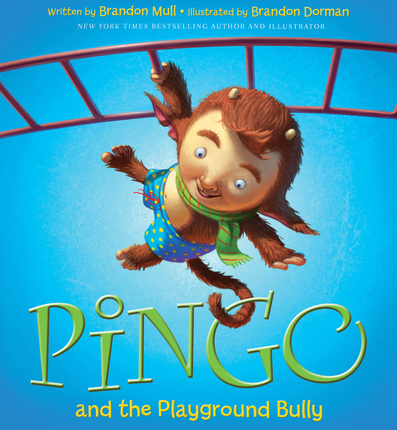 Pingo is a fictionalized story that has been replayed time and time again in the real world. Imaginary friends are just part of make believe, but competition to find out who is the “best” in certain areas happens all the time. Pingo combines the two into an enjoyable story with an honest look at feelings, friendship and fun. This story was educational and delightful. Have you ever felt left out? I'm sure everyone has a story to share. I definitely do so I enjoyed this story about the power of kindness and the importance of always including others. It is super important to teach our children about showing kindness to others especially in this day of age. The illustrations by Brandon Dorman were marvelous. His illustrations were colorful and delightful. I felt like I was on the playground with my imaginary buddy. Brandon Mull wrote this fun story and it doesn't surprise me that he is also the author of the New York Times bestselling Fablehaven series as well as the Beyonders series. Pingo definitely saves the day in this extraordinary story. Loved!! !